After not having any activity since a denial of being Dorian S. Nakamoto in 2014, Satoshi Nakamoto’s account on P2P Foundation is showing some surprising movement. Just a few hours ago, he added a Brazilian developer as a friend and posted a mysterious message in Arabic. The P2P Foundation is an organization that tries to leverage the benefits of the technology that it takes its name from. Satoshi published on their Ning forum one of the first papers describing Bitcoin, and was active in several discussions. Just 14 hours ago, his account showed the first activity since 2014. Nakamoto posted a message with the word ‘nour’ in it. It seems as if the closest phonetic realization would be the Arabic word for light, or glow. The timing of his tweets leaves CSW out of the equation for being the author of the latest activity on Satoshi’s P2P account, as several Reddit members pointed out. The other modification into Satoshi’s account was adding up Wagner Tamanaha as a friend, a blockchain and cryptocurrency enthusiast from Sao Paulo, according to his Twitter profile. Tamanaha also runs a blog on the Steemit platform, where he has more than 1,500 friends and 3,700 posts. “Satoshi seems to have reappeared and I am being investigated”, he twitted just an hour ago. Chepicap has already gotten in touch with him and this article will be updated with any replies. UPDATE: Tamanaha has just tweeted stating that "he added Nakamoto about a year ago on P2P Foundation and, for his own surprise, the friendship request got accepted". 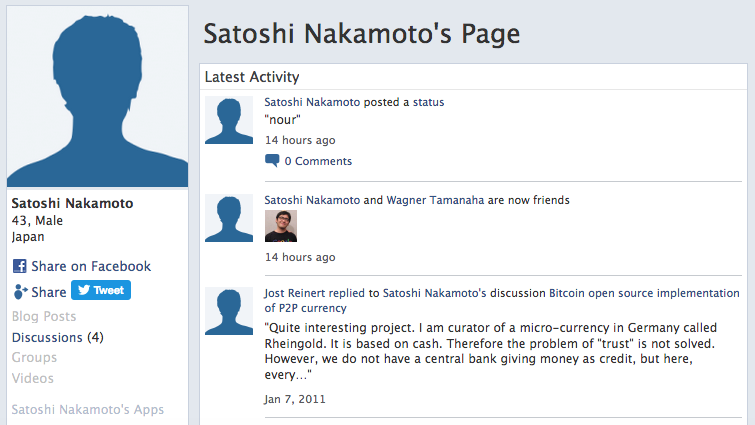 As can be seen on this post, Satoshi was last active on P2P Foundation’s Ning forum back on the 7th of March of 2014, when a comment from his account on a 2009 post stated ‘I am not Dorian Nakamoto’, perhaps responding to a Newsweek story that claimed having found the original creator of Bitcoin. Before that message, the activity of the account is nonexistent all the way back to 2011, when its last message taking active part into the building of Bitcoin was published. Other media have pointed out the possibility of Satoshi's email linked to his P2P Foundation account being compromised in a hack. Do you think this message was posted by the real Satoshi?